Increasingly, offices are designed not just to be functional, but also to provide a environment that fosters maximum creativity and productivity from employees. Much thought and care is put into selecting design elements to achieve this. Colours, fabrics, furnishings and artwork are carefully chosen with the goal being to ensure employees enjoy the time they spend in the workplace. Many studies have shown that plants in the workplace have a key role to play in enhancing an employee’s emotional well-being. People love plants. The benefits of plants in offices have been discussed in prior blogs and are listed on our website. I would like to focus this blog on how we, as interior landscape professionals, can work with the design community and its clients in a partnership to successfully include plants in design projects. In recent years, we have been asked to consult on office design projects more frequently. We have formed excellent business relationships with several firms in the GTA that have resulted in successful interior landscaping for their clients. We would like to see this trend continue as it offers benefits to all parties involved. With the increased attention placed recently on enhancing the workplace, new studies on the importance of bringing a bit of the outdoors inside have caught the attention of designers. Often plants are an afterthought; once the office is complete, the employees ask to bring in plants, or to have the employer purchase plants. Designers have told us this can be frustrating. The containers may not suit the décor, the plants may not be located in suitable areas and may compete with other elements such as artwork and furniture. Improperly selected plants are difficult to maintain and can quickly bring down the appearance of an office. 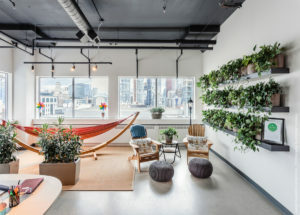 Plants enhance a collaboration area in a Toronto office. Ideally, we are called in during the budget stage of an office design project. Together with the designer, we can look at floor and furniture plans and determine an approximate number and rough locations for the plants. We can present options for containers, and decide on the size of the plants (trees, floor plants, table-top plants). With this information we can provide an approximate cost for the plants, containers and weekly maintenance after installation. Knowing these costs at this stage will eliminate any surprises and hopefully ensure the plants will be part of the finished project. To be able to suggest specific plants, a site visit is required. We need to assess the light levels in the areas where the plants will be located in order to recommend suitable plants that will grow and thrive. We will also ask questions about any window coverings, overhead lighting, ventilation and heating ducts etc. All these details can impact the plants and will be taken into consideration when we make plant suggestions. Our strength and skill lies in the horticultural component of successful designing with plants. We want the plants to look healthy and strong for many years. We work with many container suppliers and can source any style and colour of container. We keep up to date on design trends, and look for suppliers that can provide the latest styles. We supply containers that are designed for interior use and will not leak. Lead times for containers will range from several days to weeks or months for imported containers. No light? No problem! We can also provide suggestions for high quality artificial plants for areas that may not have enough light to support live plants. Many office plantscapes are designed using a combination of live and artificial plants. We have also completed several plantscapes consisting entirely of artificial plants.